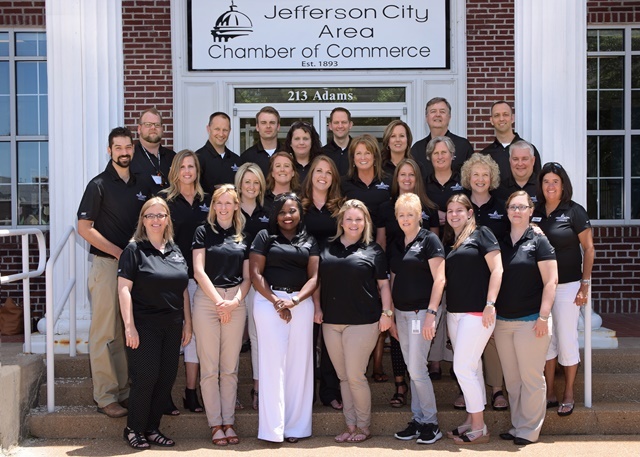 These groups of business professionals experienced eleven sessions over six months designed to expand their leadership skills and broaden their understanding of our community. 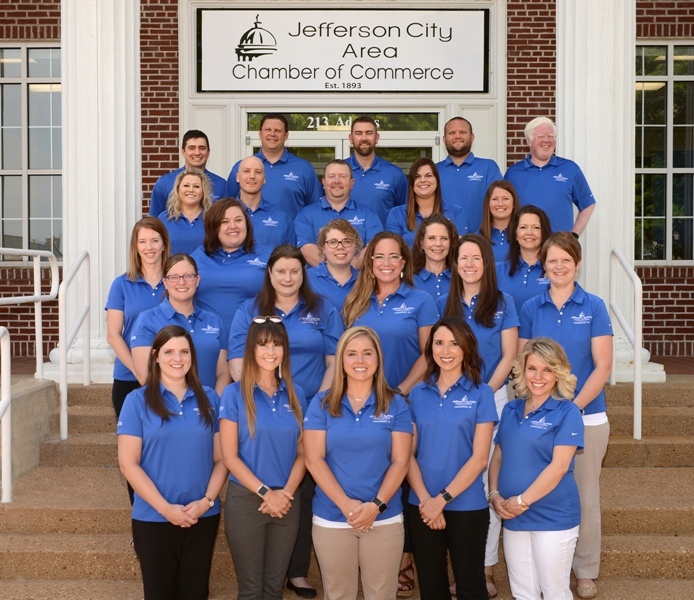 Class members are: Row 1, l to r: Kimberly Guthrie, Newman, Comley & Ruth PC; Amber Brondel, United Way of Central Missouri; Ashley Atkins, Capital Region Medical Center; Ilana Holland, Whaley's Pharmacy, Inc.; Alina Barnes, Missouri State Government. Row 2, l to r: Melissa Willett, Bartlett & West, Inc.; Megan Eldridge, City of Jefferson; Angela Nale, Central Bank; Robin Bernskoetter, Art's Pest Control, Inc.; Mandy Lawrence, Compassus- Hospice and Palliative Care. Row 3 l to r: Brittney Mormann, Jefferson City Convention and Visitors Bureau, Inc.; Natalie Newville, Missouri River Regional Library; Brittany Elder, Candlewood Suites Hotel; Michelle Girard, The Architects Alliance, Inc.; Samantha Suthoff, City of Jefferson. Row 4 l to r: Alaina Winship, Jefferson City Medical Group (JCMG); Lucas Bernskoetter, Midwest Block & Brick, Inc.; Robert Ritchey, SSM Health St. Mary's Hospital; Renee Struemph, Missouri Hospital Association; Stephanie Bruemmer, City of Jefferson. Row 5 l to r: Chris Buschjost, Hawthorn Bank; Brandon Korsmeyer, Korsmeyer Fire Protection; Dr. Brandon Johns, Align Chiropractic Clinic LLC; Adam Boessen, Scruggs Lumber Company; Andrew J. Sartorius, Sartorius Kirsch, LLC. Not pictured: Michelle Clark, Scholastic Inc.; Leslie Fischer, Missouri State Government; Lt. Mike Sneller, County of Cole; Nicole Wilson, C & S Business Services, Inc.
Class members are front row (l to r): Sharon Knorr, Hawthorn Bank; Jennifer Winkelman, RE/MAX Jefferson City; Andria Hendricks, Lincoln University; Brittney Henson, Domenico's Italian Restaurant & Lounge; Nikole Peek, Scholastic Inc.; Pamela Buettner, Flat Branch Home Loans; Melinda Cardone, Independent Living Resource Center, Inc.; second row: John Martellaro, Martellaro Marble & Granite; Christina Stegeman, Jefferson Bank of Missouri; Amanda Graham, Jefferson City Medical Group (JCMG); Jennifer Suchanek, City of Jefferson; Christi Spaunhorst, Providence Bank; Dr. Linda Landon, Research Communique; Lisa Collier, Hollon Family Chiropractic; third row: Michelle Hughey, Capital Region Medical Center; Janine Haynes, Missouri Hospital Association; Christina Prucha, State Technical College of Missouri; Andy Carroll, City of Jefferson Parks & Recreation; back row: Bradley Kellerman, Joe Machens Capital City Ford Lincoln; Sgt. 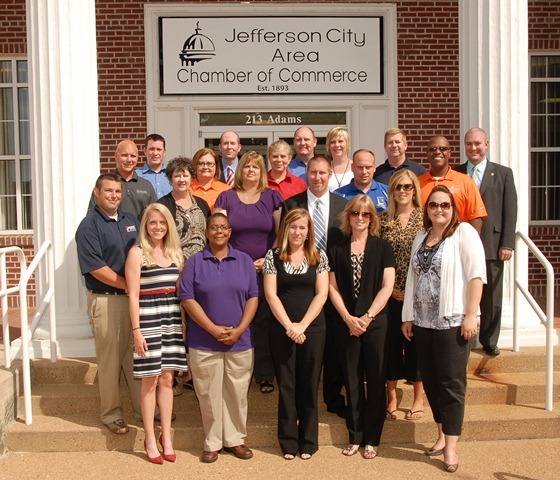 Chad Stieferman, City of Jefferson JCPD; Ryan McDaniels, Newman, Comley & Ruth PC; Tammy Gilpin-Coplin, Midwest Block & Brick, Inc.; Justin Holliday, SSM Health St. Mary's Hospital; Natalie Roark, MoDOT - Central MO District; Rev. 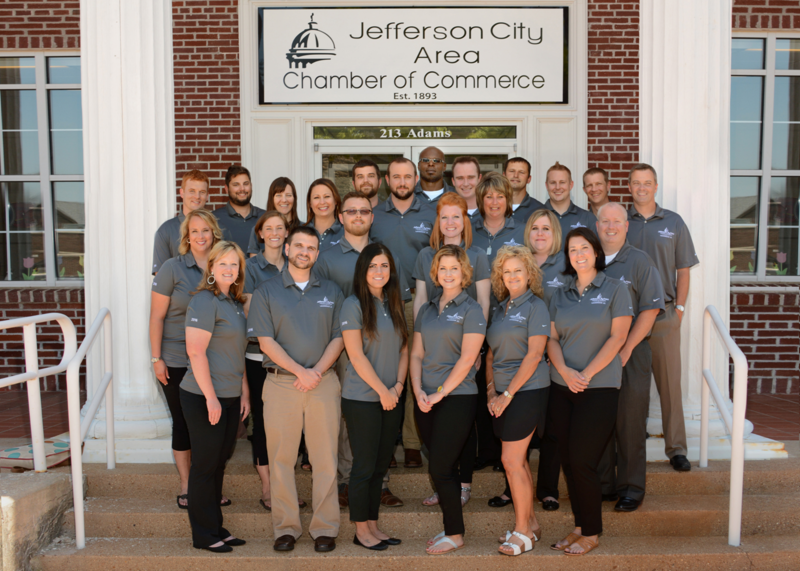 Tony Alter, Faith Lutheran Church; Patrick Kremer, Central Missouri Professional Services, Inc. Not pictured: Ryan Drewel, Whaley's Pharmacy, Inc.; Jeanette Guajardo, Candlewood Suites Hotel; Suzie Sharpe Dillane; RedWood Financial Group. 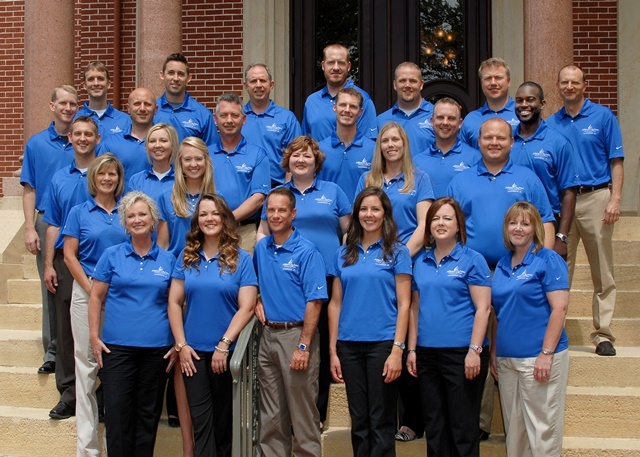 Class members are first row (l to r): Karen Enloe, Anne Clouse, Denny Hamilton, Kelsey Sandbothe, Amie Wheeler, Amy Shaw, Second Row: Jean Klindt, Lauren Maddox, Claudia Schoonover, Ashley Varner, Nathan Hays, Third Row: Patrick McKim, Kacey Young, Forth Row: Mike Hyde, Mitch Rademan, Michael Swanigan, Derek Schnieders, Ross Kasmann, Willie Jude, Fifth Row: Adam Veile, Adam Hogg, Stan Mantle, Aaron Kliethermes, Steven Buhr, Jamie Reed, Travis Koestner. Not Pictured: Kathleen Cavender, and Gary Davis. 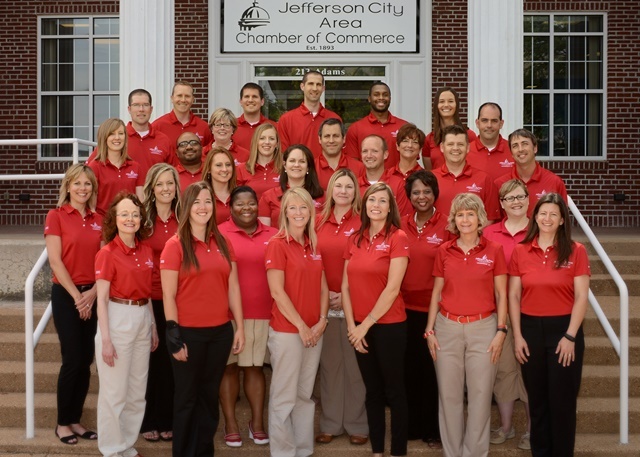 Brandon Atchison, Third row: Chris Leuckel, Doug Ruediger, Jason Ludwig, James Singer, Jenna Meyer, Melissa McNutt, Paula Burnett, Chris Wilson, Don Holloman. Not Pictured: Cassandra Atchison, Steve Doede, Jerome Offord, Josh Werdenhausen.